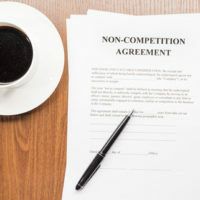 Is Your Company’s Non-Competition Agreement Legal? Employees are often required to sign various documents when taking on a new job. One of these documents is a non-competition agreement. Also known as a non-compete, this document is similar to a contract. It prohibits an employee from working for a competitor and sharing trade secrets. In exchange for the employee’s loyalty, the employer offers them a job. Non-competes are often used in competitive industries, such as technology. However, they are deemed controversial because they can limit an employee’s ability to find suitable work in the same field should their employment with a company end. Therefore, it is important that the non-compete meet certain legal requirements in order to be enforceable in a court of law. This means that the employee is not allowed to perform similar tasks with a different employer. This bars an employee from sharing trade secrets and other confidential information with other companies. Nonsolicitation of employees. This clause prevents former employees from taking away your other employees so they can work for competitors. Nonsolicitation of customers. This bars former employees from taking away your customers. Are Non-Competes Enforceable in Court? For the most part, courts will uphold the terms of a non-compete agreement as long as it meets all the legal requirements. Since non-competes tend to limit one’s employment prospects in an already-tough economy, they can be deemed unconstitutional if they lack fairness toward the employee. In order for the non-compete to be valid, it must be limited in time, effect and geographic scope. So what does this mean? How long does the agreement last? One cannot last indefinitely. They are valid only for a limited amount of time, which typically equals two or three years. Anything beyond that timeframe would not be enforced in court. A non-compete can limit an employee’s ability to work for a competitor, but only to a certain extent. For example, if your company manufactures smartphones, forbidding your employees to work for any competitor in technology is way too broad to be enforced. Geographic scope. This depends on the size of your company. If you are a small company, forbidding your employees to work for a competitor anywhere in the state is way too prohibitive. Even prohibiting one to work in the same county may be a bit too harsh. But if your company has offices throughout the state, then you can legally enforce restrictions that cover a larger geographic area. If your non-compete is not drafted properly, it may not be enforceable in court. Make sure you protect the interests of your company and keep it competitive for years to come. Godfrey Legal will ensure that your document contains the right verbiage to ensure that both parties involved—the company and the employees—are protected. We have helped companies of all sizes secure their information, customers and employees. Contact us for help with your company’s non-compete agreement. Schedule your consultation today by calling (407) 890-0023.